(Bloomberg) -- The rally in Chinese stocks has been bad news for the Hong Kong dollar. Equity investors are selling the currency for the Chinese yuan and buying mainland shares through the stock trading connects, according to Ronald Man, a strategist at Bank of America Merrill Lynch. That’s keeping the Hong Kong dollar lower in the spot market, he said. The currency has been at the weak end of its trading band for much of this month. Net northbound fund flows have climbed to around 130 billion yuan ($19.4 billion) this year as of Monday, with sentiment helped by Beijing’s looser monetary policy and an easing of trade tensions with the U.S. The market could be further supported by foreign inflows, as MSCI Inc. expands the weighting of mainland-listed shares in benchmark indexes tracked by global investors. 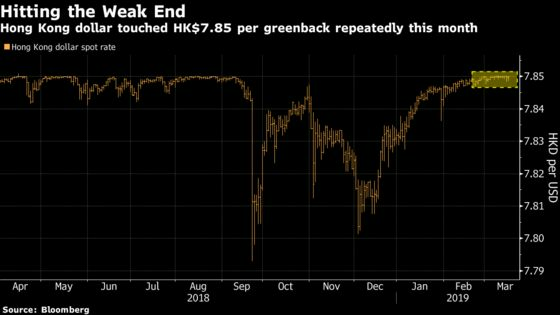 The Hong Kong Monetary Authority spent nearly $1 billion defending the exchange-rate peg this month, as the Hong Kong dollar’s wide interest-rate discount to the greenback makes shorting the city’s currency lucrative. The latest intervention by the HKMA came Monday U.S. time. The yuan has advanced 2.4 percent this year, Asia’s second-best performer, and is near its strongest against the Hong Kong dollar since July. Funding long yuan trades with the city’s currency is a better choice than using the greenback as it has lower borrowing costs, said Mingze Wu, a Singapore-based foreign-exchange trader with Intl FCStone Global Payments. The Hong Kong dollar was little changed at HK$7.8496 per greenback as of 9:58 a.m. Tuesday, while the yuan was steady at 6.7149 per U.S. dollar. The Shanghai Composite Index was also little changed after jumping 2.5 percent Monday, its biggest gain in three weeks.